Villa Borghese, located in the centre of the city, just north of the Spanish Steps, with its main entrance at the Piazza del Popolo and Porta Pinciana. is the largest public park in Rome. Created by Cardinal Scipione Borghese in the 1600's, this elegant park has a lake, plus number of temples, fountains, statues, and several museums. In In 1911 the World Exposition was held in the park, and several of the pavilions built at that time still remain, probably the most impressive of these is the British School, built from a design by Edwin Lutyens, who was one of England's greatest and most prolific architects. The park also contains the Piazza di Siena which is an amphitheatre, an 18th century arch, the arco di Settimio Severo, and a botanical garden. If you are on foot, the park can be reached via a pedestrian tunnel that runs from the entrance to the metro station at the Piazza di Spagna, to the front of Villa Borghese at the top of the Via Veneto. The area was originally a vineyard, then in 1605, a nephew of Pope Paul V, Cardinal Scipione Borghese, commissioned landscaper Domenico Savini to design a park. Then from an original sketch by the cardinal, architect Flaminio Ponzio built a villa. The park, which was originally created to a very formal design, was later laid out in a more natural way. At the end of the 18th century in the middle of the park, a lake was created, and in that lake, an island was created, a small Ionic temple dedicated to Aesculapius, the God of healing, was built on the island. In 1903 the city obtained the Villa from the Borghese family, and for the first time, the park was opened to the public. The collection began with the gallery's founder, Scipione Borghese, who by the time of his death in 1633 had accumulated some of the greatest art treasures of all time. The collection suffered when Napoleon's sister, Pauline, who married Prince Camillo Borghese in 1807, sold off most of the collection. Today many of those works of art from the original collection can be seen in the Louvre museum in the city of Paris. 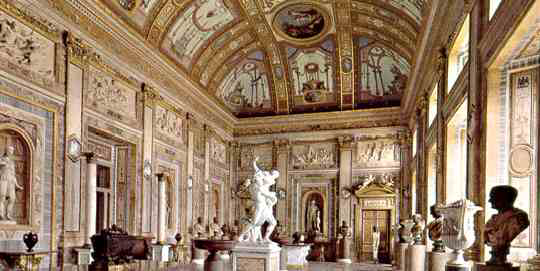 In 1997, after a major renovation, the Galleria Borghese was reopened. Today on display are such masterpieces as Bernini's Apollo and Daphne, Titian's Sacred and Profane Love, Raphael's Deposition, and Caravaggio's Jerome.